Enjoy our Homemade, Crispy, Buttery Caramel Corn and Popcorn Balls. 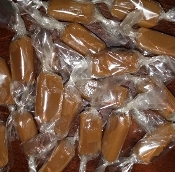 And our Mouth-Watering Caramels and Lollipops. All of our snacks are Made to Order. We have a variety of flavors and more to come! Our homemade treats are convenient for parties, holidays, movie nights, or any type of event. We can also create custom orders for your event.